In the latest episode of Bigg Boss Telugu Season 2, Deepthi was seen comforting Kaushal, who is fasting out of anger. The rest of the housemates discussed the hunger strike of Kaushal, the current voting pattern and Nani’s feedback this weekend. Deepthi read out the next task in ‘Race to Finale level 2’. Both Samrat and Roll Rida had to take care of their respective bowl of eggs until the final buzzer. While both the contestants weren’t allowed to put their bowls down, the contestant with the maximum number of eggs towards the end buzzer would be declared as the winner. Samrat and Roll Rida locked themselves up in the jail and tried to convince each other to give up. After Bigg Boss’ clarification, they came out. While Roll Rida hid in the kitchen closet, Samrat chose to stay in the garden area. In conversation with Geetha and Deepthi, Kaushal proposed to withdraw support for Samrat and Roll Rida, so that no one goes to the finale. But Geetha and Deepthi chose to support Samrat. Kaushal, on the other hand, cleared terms with Roll Rida and supported him. Tanish tried to talk Roll Rida into letting Samrat win this task, however, Roll Rida refused to pay heed to him. Tanish questioned Roll Rida’s loyalty towards him. But the latter chose to take Kaushal’s support and stay in the game. Kaushal tried to disturb Samrat as well. But Samrat broke an egg (as a part of their strategy) trying to bring Roll Rida out of the closet. Tanish, Geetha and Deepthi also tried to bring Roll Rida out. On Bigg Boss’ demand, Roll Rida finally came out and within minutes his bowl of eggs broke. Roll Rida and Kaushal then tried to disturb Samrat. While Geetha and Tanish blocked Kaushal, Deepthi handled Roll Rida. Bigg Boss ordered Tanish and Kaushal not to engage in a physical fight. Roll Rida, in the process of disturbing Samrat, injured himself. 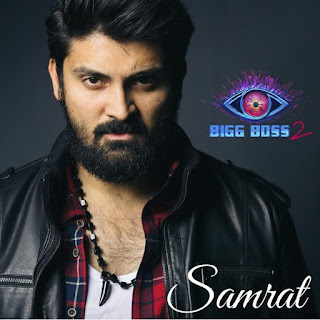 He soon gave up and eventually Samrat won the task becoming the first finalist of the second season of Bigg Boss Telugu Season 2. Roll Rida thanked Kaushal for his support. As per the next (sponsored) task, the housemates, in pairs, had to present a creative and amusing advertorial highlighting the features of a refrigerator. The pair with the most creative and entertaining advertorial would win the task. Each pair presented their concepts. This isBigg Boss Telugu Season 2 September 20 Samrat Reddy becomes the first finalist of the season. Thank you don't forgot to bookmark this website and share with your friends and family. And give me your valuable suggestions as comment below. This article is about Bigg Boss Telugu Season 2 September 20 Samrat Reddy becomes the first finalist of the season.